Financial information is on PDF page 39. The loss does not include depreciation on the building which will add 100’s of thousands of dollars to the loss. Did Scott check to see how much all those empty buildings are paying in property taxes? If the City seizes them legal expenses will explode and no property taxes will be paid. The current owners aren’t going to allow their properties to be taken for pennies. Those holding loans on the properties won’t either. David Bentley, owner of the CII East building, sued the City over TIF dollars. Tens of thousands of dollars were spent by the City defending their actions. Does Scott think he will give away his building? The weeds are still growing in the planter boxes, very attractive. If the goal is to provide space for a bus transfer station, that property won’t generate any future property taxes. I wonder how District 87 feels? Bloomington population is slightly higher, but debt is close to $100,000,000 higher! A lot of Bloomington’s debt is from failed attempts to revitalize downtown with the Coliseum and BCPA. Both are a drain on City finances. Scott Black wants more of the same. Scott Black wants people who pay City bills by check or cash to be penalized. 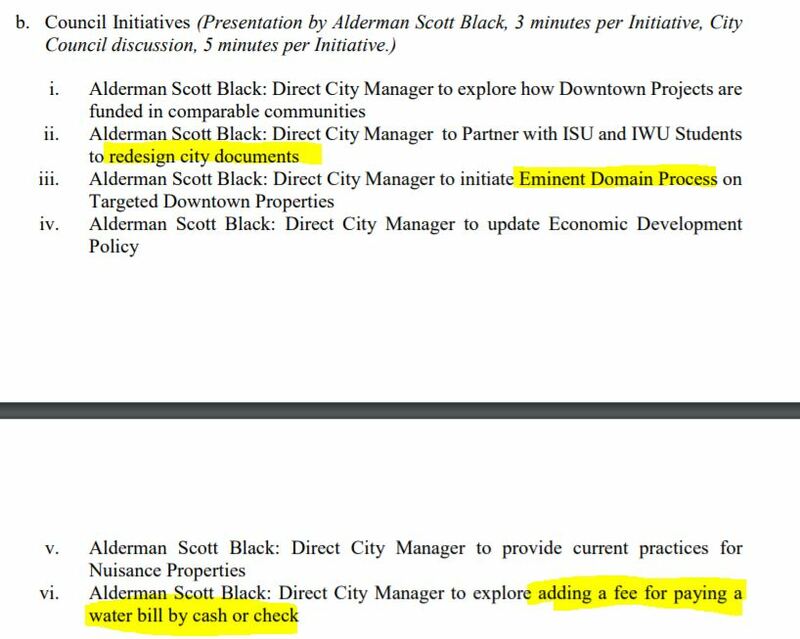 I wonder if Scott even knows the City is penalized when people pay by credit card? This is yet another attack on the poor and elderly. Nice. Why do City documents need redesigned Scott? How progressive of you! Voting does matter, Georgene Chissell wants to replace David Sage. She wants to use eminent domain too. Is Ward 2 listening? Posted in BloNo, Bloomington, BLOOMINGTON CITY COUNCIL, downtown hotel, elections, Liberal Media, Local, Progressives, Renner, Taxes.Tagged Bloomington debt, Coliseum, Decatur debt, Downtown Bloomington, eminent domain, Georgene Chissell, Grossinger Motors Arena, penalize cash, Scott Black, VenuWorks. Scott is Renner’s mouthpieces. Each of these requests are about control. Yup. Snotty Scotty is Tari’s button man. It is 100% about control. Both of them, and Mathy too, lament that the current businesses don’t stay open during the farmer’s market, don’t have the “right hours”, and/or are not actively engaged with the Downtown events and DBA (or whatever its called now). They want to control who does business in Downtown just like Normal does in Uptown. It’s only a matter of time. Excuse me: a penalty for paying your water bill? The City doesn’t even fine those who violate City codes. Landlords are not fined, they are asked to comply at Administrative Court. The City will be charging for “water bill insurance” unless the property owner ops out. Does Scott have a problem with his memory? A fee for paying a water bill by CASH is not only totally asinine, but Illegal! I believe it reads” This note IS legal tender for ALL debts public AND private””.. Maybe he should have Tari read him the Constitution and other such laws..
their agenda for there will be a backlash in due time. Conspiracy theory… Perhaps, eminent domain will be used to secure the State Farm building. No one is interested, not a single serious buyer. State Farm doesn’t want to guard an empty building and fix maintenance issues for a vacated place. So, Tari swoops in, claims the city is getting a “bargain” for pennies on the dollar, SF gets to leave a headache behind, take a check, and perhaps claim a tax write-off. And Tari, having a lilliputian complex, will have one of the TALLEST buildings in town as HIS achievement! Hopefully he’ll GO AWAY after that-A LONG WAY AWAY!